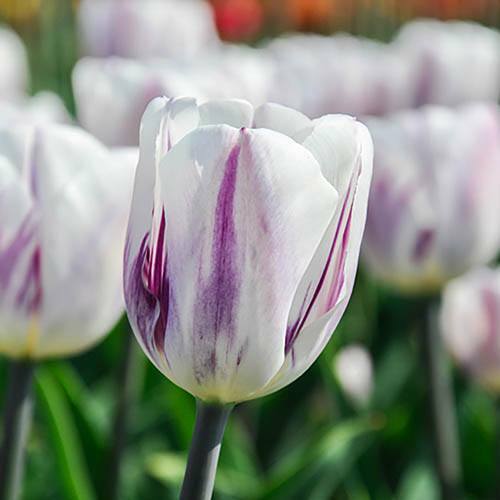 A beautiful tulip with a pure white flower with deep purple flames. A beautiful tulip with a pure white flower and deep purple flames running up the outside of the petals. Surprisingly hardy and weather resistant, they're so easy to plant and grow which would explain why they're one of the most popular bulbs. Tulips are great planted with many different colour variations to give a fresh, vibrant spring colour to your garden, patio or decking. Try planting 'Flaming Flag' alongside another purple variety such as 'Queen of the Night' to really set off the white petals, or mix up with 'Washington' for another striking two-tone flower. 'Flaming Flag', as with all our other tulips, make fantastic cut flowers as they are not only easy on the eye but they last exceedingly well in a vase.